Real Estate industry, out of the need to maximize their returns, they have to resort to advertising, like any other. With the growth of the media, opportunities to advertise increased vastly and so did the requirements of the photograph, both in their quality and quantity. Once a single print medium, like the daily paper, it has grown to brochures and high class glossy periodicals. Other avenues like the web, TV, internet, and their connect ability to mobiles, laptops and the like has caused an increase in both the quantity and quality of real estate photographs. Consequently complexities of photography has also increased leading to the advent of real estate photography and editing services. The challenges of quality was met by the digital electronic industry resulting in ever sophisticated digital cameras designed for special fields like sports, wildlife etc. With the advent of digital photography problems associated with the technology has also come to the fore. These challenges to the quality and the need to handle large volumes of work have given birth to a service industry called Photo Editing Services. The operations of this industry are very exacting, highly technical requiring a thorough knowledge of software specially developed and great skills and experience. This has spawned the professional service providers. 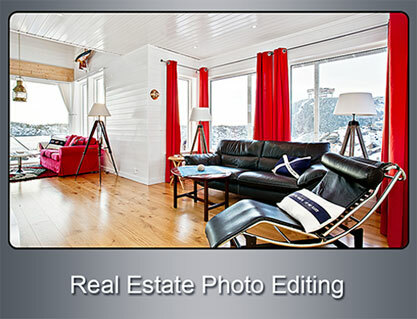 Some of the more important steps in Real Estate Photo Editing are enumerated below. Real Estate Photos are taken in a large number of frames at different times. These single shots cannot give an idea of the grander of the finished projects, a prerequisite to entice the clients to be duly impressed into buying the property, hence the need to enhance the images. This involves a large number of steps each affecting the quality of the final product. The most important step is the stitching of the individual shots. This is not easy as the various shots are taken at various times, with different angles, different backgrounds, foregrounds, different sky condition etc. The first step is to merge all the shots and align them properly. This is done by the help of powerful software which measures the “points of interest”. These are areas which have large intensity variations in all directions like corners. The individual shots are taken with large overlaps. This software tracks the corners and edges and aligns the individual frames into a composite one. The next step is to homogenize entire shot of uniform tone. Image calibration aims to minimize differences between an ideal lens models and the camera-lens combination that was used, optical defects such as distortions, exposure differences between images, vignetting, camera response and chromatic aberrations. This gives the software information regarding the changes that needed to be corrected. This step is to blend the images. In this the softwares effect the corrections detected in calibration. Colors are adjusted between images to compensate for exposure differences. If applicable, HDR merging is done. It is inconceivable in nature to get a continuation of the sky, light and other natural conditions. Hence it is imperative, to get a uniform composite look, these variations are ironed out. Powerful software is available to effect the required changes in sky patterns, color etc. Similarly the foreground can also corrected to look continuous after removing distracting objects like bins, carts and the likes. Human vision is complex (eye and brain combined) can perceive the differences in the intensity of light. In ordinary photography the bright highlights are likely to wash out to white and the dark tend to end up as big blobs of black. HDR though high sounding is basically the difference between the lightest light and the darkest dark your camera can detect. And this is called the dynamic range of the camera. If the object goes beyond this range the high lights will be washed into white and the darker ones into blobs of black. It’s notoriously difficult to snap a photo that captures both ends of this spectrum, but with modern shooting techniques and advanced post-processing software, photographers have devised ways to make it happen. What is done is to take a series of photos of the object at various exposures and apertures. Then these photographs are mashed and with advanced powerful software a single image comprising the most focused well-lit, and colorful parts of the scene is created. In conclusion it may be re emphasised that real estate photography has grown into a hugely technology intensive art. To obtain really enticing photographs of high quality it is important that the help of experienced, skilled, professionals of an artistic bend of mind is essential. They need access to and support of high quality infrastructure too. All these requirements are found only with professional service providers of high repute. Photo Editing India is such a group. They have all the requisites to execute large orders under tight time frames. Their high quality infrastructure, highly skilled and trained personnel with good experience ensure high quality products in large numbers at competitive costs.